My sister Karen loves peaches more than anything. We tease her constantly about putting peaches in EVERYTHING. I mean, the woman is batcrap crazy with these things! Peach pie, peach cobbler, peach anything she can think up! Her birthday is coming so I did one better, I surprised her with a tart. I knew she hadn't ever made it, attempted to make, or eaten it so, what does good old "perfect 10" do? Uh huh, she makes food wishes for Karen come true! HA! By the way, I am the youngest of 10 children, I recently decided it took my parents 9 children before they got a perfect 10, so I have made it my new nickname. Like it? HA! By the way, my sister Peg, puts peas in everything. Gah! Seriously though, she does love peaches. This tart is so simple. It isn't overly sweet, but it is a dream. I used a couple of my old tried and true recipes and just smacked them together. They blended beautifully and Karen got her birthday dessert a few days early, and the world is just as it should be! I am happy to share this with you. You could trade the peaches out for strawberries, blueberries, raspberries, I mean, you could even do pears or kiwi or a mix of your favorite, GOD BLESS AMERICA the options are endless!!! It has a few steps but none are hard. So don't freak out..........k? My tart pan is rectangular but you will use any tart pan you have. This crust could work for a bazillion tarts. Let your creativity run wild! Not like running naked through the jungle wild, but wild in a clothed kinda way. Ya know? Preheat oven to 325 F. In a bowl mix flour and sugar. Using a pastry cutter, blend in softened butter. Combine until mixed and you can squeeze it together and it stays in a clump. Spray tart pan with nonstick cooking spray just as insurance and press down into a crust. Make sure it goes up the sides as well and make it as even as possible. Bake for 15-18 minutes or until slightly golden brown. You will know when it is done, trust me. Remove and sit aside to cool while you make the pastry cream! Beat your egg yolks in a bowl and set aside. In a heavy saucepan mix together sugar, cornstarch and salt. Slowly add in half and half, mix completely. Cook over medium heat until bubbly and it starts to thicken, and then cook it one minute. Keep stirring it will burn SO easy! Now, SLOWLY drizzle some of the hot mixture into the egg yolks, whisking constantly, add in about 1 cup in total to temper the eggs and they won't scramble. When you have add approx. 1 cup of the liquid, it will heat the eggs up slowly and you can now pour them into the pot with the rest of the hot mixture. Whisk until combined and bring to a boil, cook for 2 minutes. Remove from heat, add vanilla and combine. Now, to cool it fast, set the saucepan into a heat safe bowl full of ice and stir occasionally. It will help it cool faster. The answer is, "yes", you need to peel them. 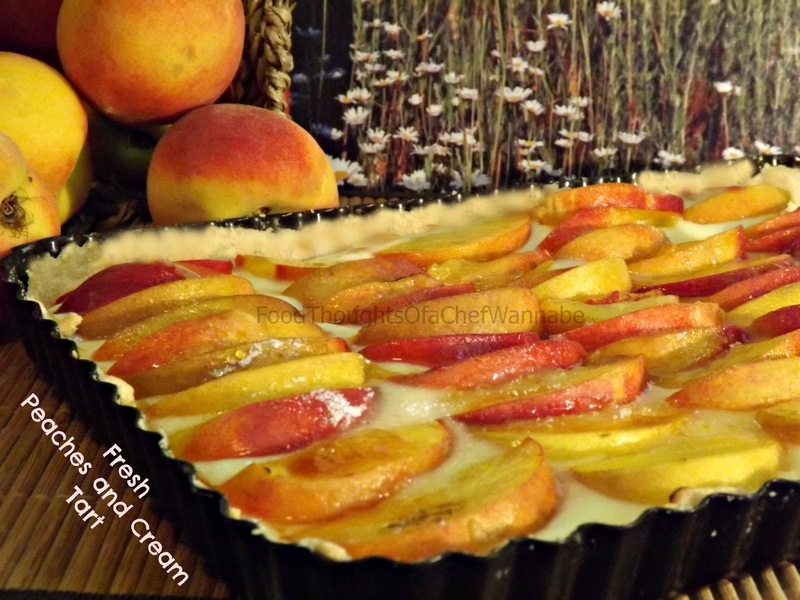 Nobody wants hairy peaches on top of their dessert, right? Add cooled pastry cream to the tart and spread out evenly. Add sliced peaches in whatever design you desire. OPTION: Just before serving, I sprinkled the top of mine with sugar and used my torch to brulee the sugar on top! There you go an easy tart you can change up 1,000 different ways! Enjoy being creative, just keep your clothes on! !